Club Penguin Cheats by Mimo777 Club Penguin Cheats by Mimo777: Club Penguin Puffle Rescue & Penguin Play Awards! Save the puffles! Save the puffles! Puffles, including Rockhopper's Yarr, are trapped in the Underground! 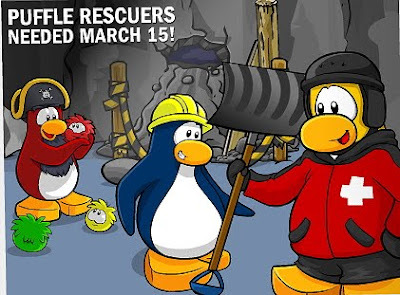 Construction in the Mine Caves will be complete on March 15th and penguins are asked to get their rescue gear on and help save the puffles! This new game is called Puffle Rescue! Club Penguin is really wanting penguins to get involved this year by being camera crews, musicians, and directors. They will even be looking for penguins to interview at the Plaza, Ski Hill and the Dock. Even the Pizza Parlor will be decorated! Wow! It looks like March is gonna be a fun month! What are you looking forward to the most? 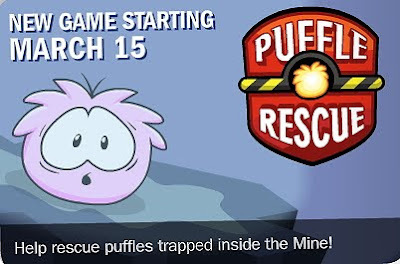 Im sure most looking forward for the puffle rescue game. I'm d to the Penguin Play Awards! It was so much fun last year but because I had only joined in January and had seen only the Gamma Girl play. Also, is there going to be a St. Patrick's Day party this year like they had last year? awesome! btw, i love your new banner! so it begins on the 15th or it already started? Did anyone notice? Saint Patrick's Day is around the corner(Wednesday of next week! ), and Club Penguin didn't even mention it! Not even in the blog, newspaper, or the Clothing Catalog! I guess that's no St. Patrick's Day party this year. Not that I miss it much, and I bet it will be worth loosing that party for the new game and the Penguin Play Awards! Wednesday of next week... that's a little far away for them to be talking about it already, don't you think? I'm sure they will celebrate it... but with the penguin play awards, and and new game and the orange puffle AND rockhopper being here, they may not want to overwelm us with funness! (is that even a word?) I bet in next week's newspaper it will have something about it... the St. Patricks day party is always pretty cool! It sounds like you're looking forward to pretty much everything! (awards... new game... that's all that's coming up!) Well, that's great! I'm happy to hear that everyone is excited. wow awesome new banner mimo you rock dude! Hey! I'm pretty sure that there will be! I hope so! I dont think we have to worry, they always have one! Why do you use a character instead of your real face? lol anyway i liked the header before better than this 1. He has to keep himself a secret(LOL) Its to protect Mimo and his family and friends. Thats why! I think so. Lets hope so! I guess we just have to wait and see! I've never been to the PPA but I already love it! I want to be a host with my own camera crew!!! Nice new header mimo your site is way better than mine!! I have always had the green puffle in the nightclub all month and year!! It has NEVER gone missing. It is there and it has Never LEFT! Me too! I'm actully looking forward to both of them. Yup! I love it too! Yes mimo does have to keep himself secret but i mean not secret secret cause then he wont even have a CPG website! yeah so mimo has to keep him self a SECRET! !